I’m a visual learner. I need colorful graphs, charts, diagrams, and mind maps. 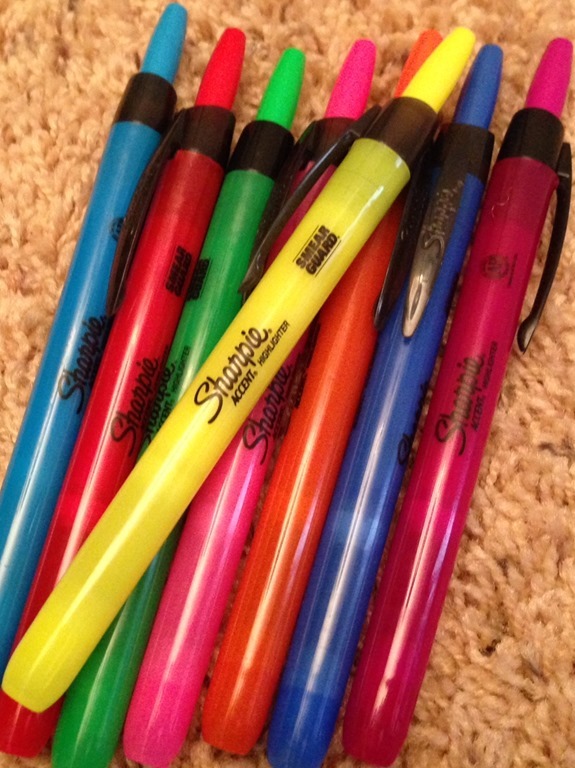 I’m weird because I like taking notes – it’s an excuse to break out pens in a variety of pretty colors. And highlighters are my best friend when trying to remember something. When I started my first novel, I just sat down at my laptop and wrote with reckless abandon. And then I hit a roadblock about ten chapters into the story. That’s when I realized I needed a road map to see how I was going to get from the beginning to that end scene that I could visualize so clearly in my head. 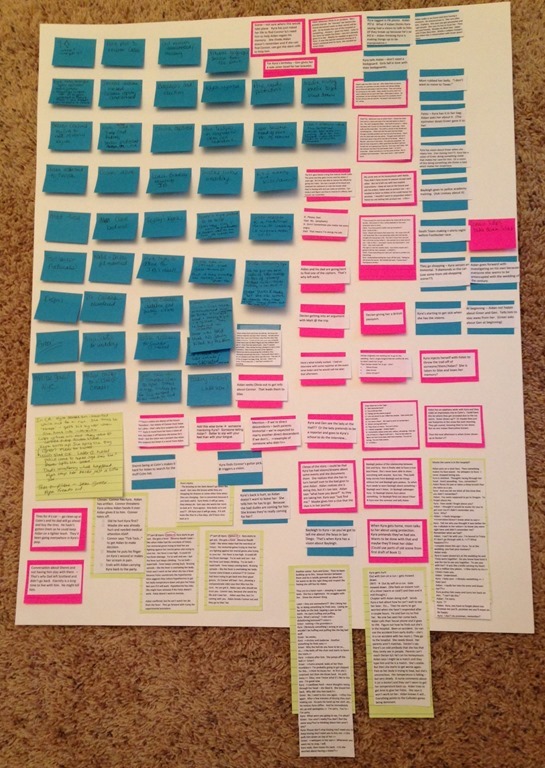 I grabbed some posterboard, colorful post-it notes and created a Story Board, aka a graphic organizer for a story. Fast forward to November… I was asked for a synopsis and the first few chapters of subsequent books in the YA Scottish Immortals series I’m trying to find a home for. After my initial joy of getting the request, I kinda freaked out. I’ve gone through the plot millions of times in my head. I even have 20K+ words of a crappy first draft of BOOK 2 and many more scenes outlined. Not to mention 50+ pages of notes on my laptop and in my trusty “BOOK 2” spiral bound notebook. But… a synopsis? Nope. Don’t have one. I have an idea of how I want the next two books to end, but the map hasn’t been drawn yet. So last weekend when we were travelling to South Carolina for my daughter’s cross country meet, I was fully prepared to write the synopsis on the long, monotonous seven-hour trek. However, as the hours crept by during the initial leg of our journey, my frustration rose with each passing mile. 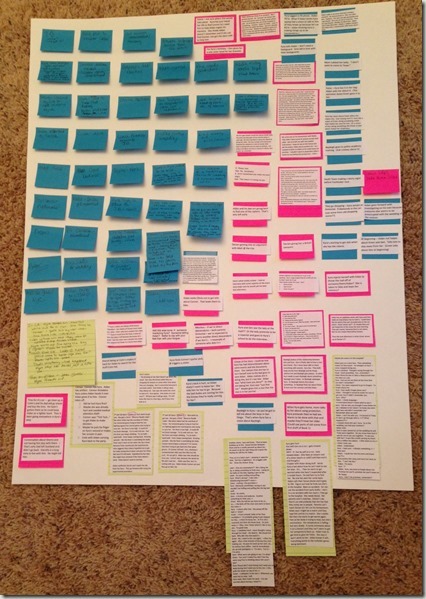 All the notes…All the ideas… All the directions the story could go… It was like looking at a jumbled pile of puzzle pieces. 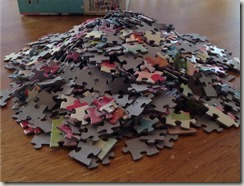 Not a fifty piece puzzle. One of those 1000 word beasts. 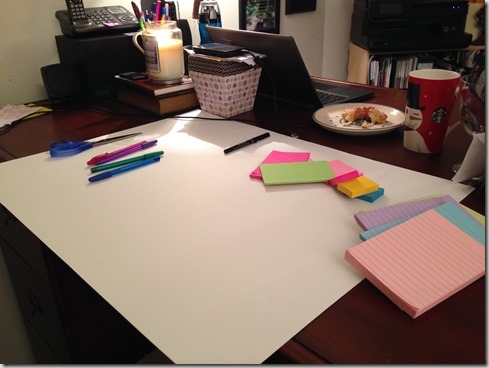 So what’s a neurotic writer to do? 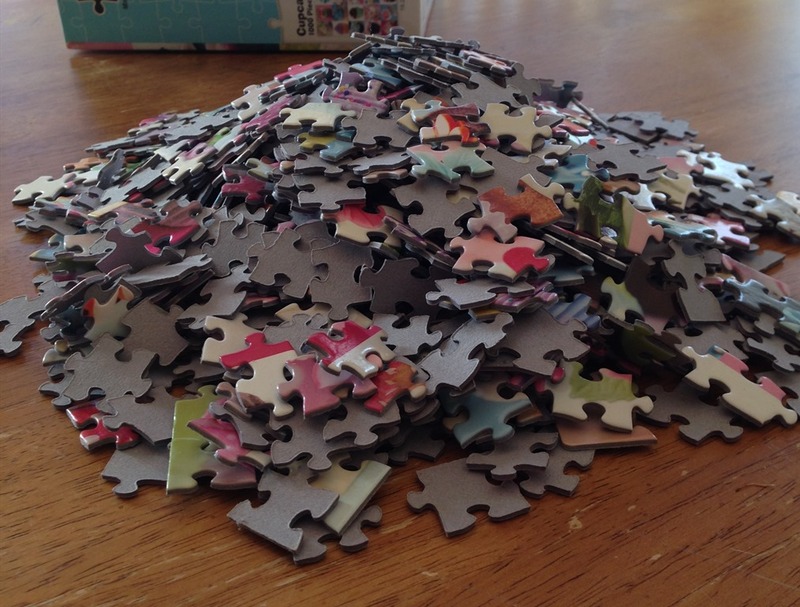 Separate the puzzle pieces. These are the overarching themes, major plot points and some facts about the story that I want to make sure are revealed in these next two books. See that stack of paper to the left? That’s a stack of notes that has to be translated to scenes. First, I’m just getting all of the scenes on post it notes and sticking them on the board. After I have all the ideas on the board, I’ll organize them in chronological order and separate into two boards – one for Book 2 and one for Book 3. I anticipate another few days of working on this before I’m ready to start writing the outline. 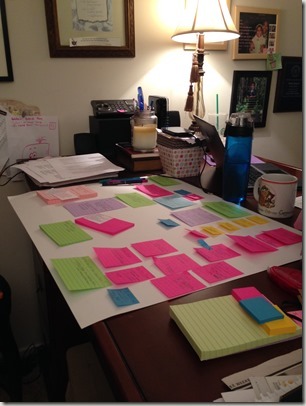 The beauty of using post-it notes is that I can move scenes around as I need to without re-doing the entire board. It’s actually quite fun.